Correct Marine / Ship Spares Worldwide! Correct Marine offers European service 7 days a week without holidays, prompt execution of orders and a complete range of services, virtually without agents. These are just a few of the distinguishing features of our style of performance. We believe in taking a flexible and customized approach to every client, an approach that is self-evident to us and was the starting point of our business. 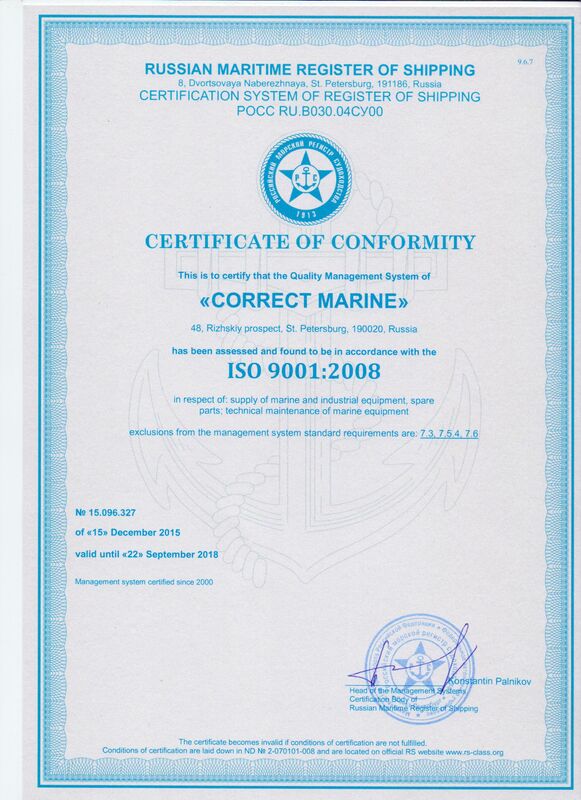 Correct Marine serves customers, following the principle 'From Project Inquiry to Order Delivery.’ We start by determining the technical and financial aspects of your request, then, having prepared a detailed proposal, we complete the order and deliver it to the port of vessel mooring in the shortest possible time. Correct Marine headquarters is located in St. Petersburg, Russia. We have our own warehouse, packing capabilities and transportation resources that enable our prompt service, loading, quality control and preparation for shipment. A professional team of well-qualified and experienced staff, with higher maritime and specialized education, put forth maximum efforts to execute your orders in the possible shortest time, aided by a continuously updated information database. 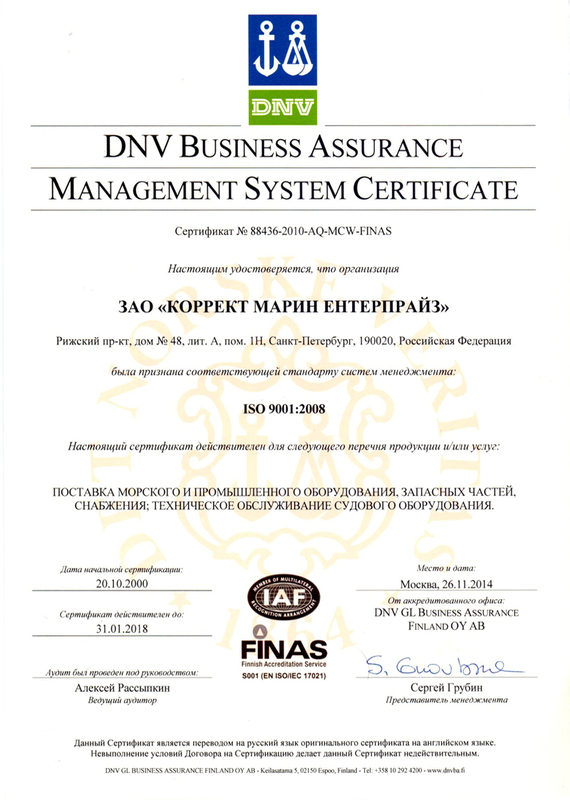 Correct Marine is a holder the following certificates: Det Norske Veritas MANAGEMENT SYSTEM CERTIFICATE № 88436-2010-AQ-MCW-FINAS, SHIP SUPPLY AND TECHNICAL SERVICE, SPARE PARTS DELIVERY. 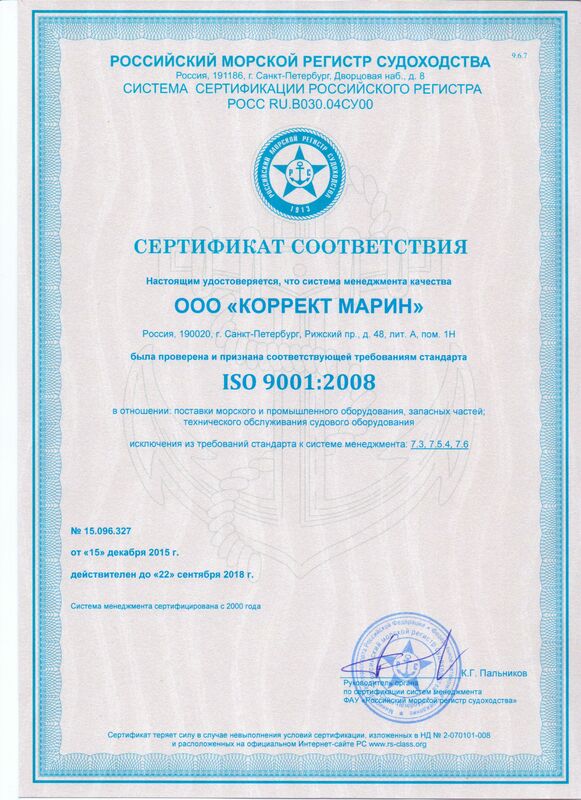 CERTIFICATE No.11.06093.120 OF FIRM CONFORMITY TO REQUIREMENTS OF RUSSIAN MARITIME REGISTER OF SHIPPING, SHIP SUPPLY AND TECHNICAL SERVICE,SPARE PARTS DELIVERY. 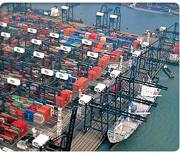 Since the founding of the company up to the present, Correct Marine has been expanding its range of rendered services. Our company is time-tested in the harsh conditions of the Russian market. We have passed this test with honour and continue developing, integrating into the world community. For over 20 years, Correct Marine has gained considerable experience serving many large companies. 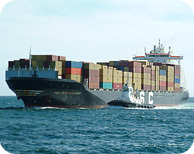 Correct Marine serves clients in Russia, Cyprus, Greece, Europe, Korea, China and elsewhere.